You can add emojis to your email subject line in the Email details section of the email editor. Click the name of your email draft or click Create email. On the Edit tab, click Edit details. Click the emoji icon emoji next to the Subject line field. Browse or search for your emoji, then click on the emoji to add it to your subject line. Enter the rest of the your Email details, then click Done. After you've finished creating your email, click Send or Publish. Emojis in your subject line add visual interest and increase engagement with your recipients. But keep in mind that too many emojis can look like spam to a recipient's email filter. In most cases, it's best to stick with one or two. Learn more about best practices for adding emojis to your email subject line. Emojis are supported by most major email clients, but they may render differently based on the recipient's email client, web browser, or operating system. For example, emojis may render in color for some recipients and in black and white for others. You can use the Test in different email clients feature in the editor to preview how your emojis will render for your contacts. 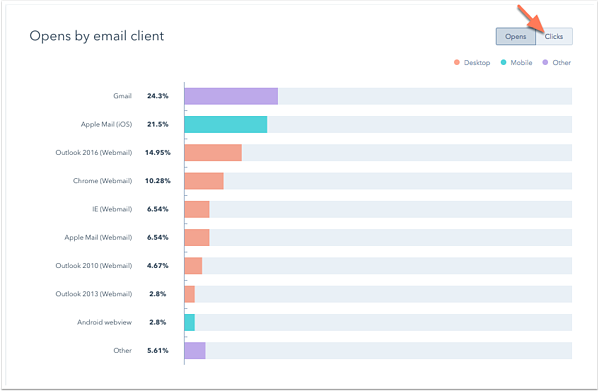 You can review opens and clicks from past email campaigns to see which emails client your subscribers use. Since emojis don't render across all clients, emojis shouldn't replace the words in your subject line. Instead, use emojis to add visual interest and engagement to your existing subject line.